On 11 and 12 June 2018 the Constitution Unit co-hosted a series of events in Rome with the Centre for Parliamentary Studies, Rome LUISS University. Events on Monday 11 June were held at the university, and showcased Constitution Unit Director Meg Russell's work on bicameralism alongside her recent book on the Westminster legislative process. 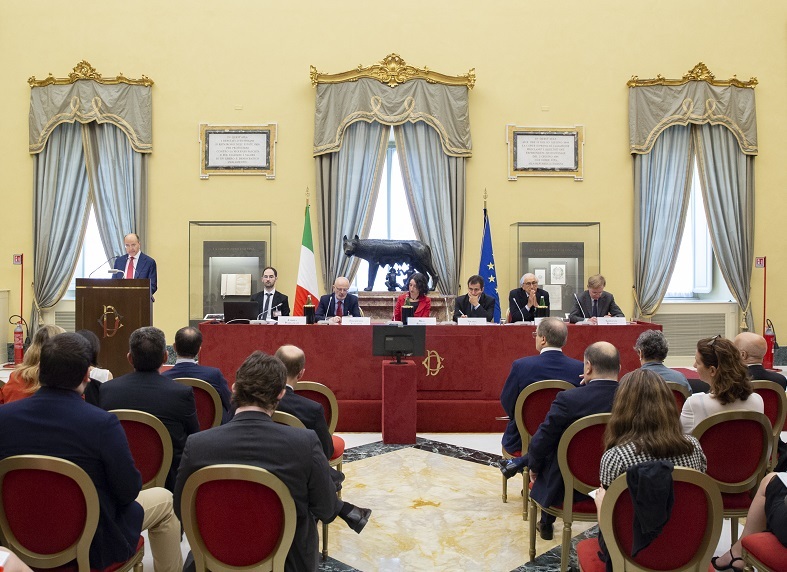 The following day a larger-scale event was held in the historic Sala della Lupa in the Italian Chamber of Deputies, inspired by Professor Russell's recent work on influence in the legislative process. Both events attracted a mixed audience of Italian academics and policy practitioners, and both were chaired by Director of the Centre for Parliamentary Studies Professor Nicola Lupo. The events were funded by the UCL Rome Partnership Fund, with support from LUISS University. At the opening event on Monday, Meg Russell presented a paper entitled 'Why are Upper Houses so Difficult to Reform? A Comparative Analysis'. The paper drew on recent failed attempts to reform the British House of Lords and the Italian Senate, but also on longer historical experience, and reform attempts in other countries such as Canada, Australia and Ireland. Professor Carlo Fusaro of University of Florence, a leading campaigner for the failed Italian reform of 2016, spoke on 'Constitutional Change and Upper Houses: the Italian Case', while Francesca Rosa of University of Foggia spoke on 'Hurdles and Limits of Reforming Bicameralism in a Stable Constitutional Context'. There were then four short responses, from Claudio Tucciarelli, a senior official from the Chamber of Deputies, Mario Midiri of University of Modena and Reggio Emilia, himself a former Senate official, and Cristina Fasone and Giovanni Piccirilli, both of LUISS University. The day ended with a public discussion between Meg Russell and Giovanni Rizzoni, Director of the Chamber of Deputies Research Service, to mark the Italian launch of her book co-authored with Daniel Gover, Legislation at Westminster: Parliamentary Actors and Influence in the Making of British Law (Oxford University Press, 2017). On Tuesday, a well-attended event was held in the Chamber of Deputies itself. Participants were welcomed by Annibale Ferrari, Deputy Secretary General of the Chamber of Deputies, and Meg Russell then gave the opening address on ' The Bicameral Legislative Process: All Is Not What it Seems', based on the central findings in her recent book. Other main speakers included Francesco Zucchini and Andrea Pedrazzani of University of Milan, and (again) Giovanni Rizzoni, who each provided analyses of the Italian legislative process. This included the launch of the parliamentary report Data and Trends in National Legislation (Italian), published that day. After coffee, the subsequent session included a number of shorter contributions from Giovanni Tarli Barbieri, University of Florence, Antonio Malaschini, former Secretary General of the Senate and now Deputy Head of Staff to the Minister of Finance, Andrea Frangioni, Chamber of Deputies Research Service, and Roberta Damiani, PhD student at the Constitution Unit - who reflected on the challenges of measuring parliamentary influence and of comparing the two systems. The closing address was given by Professor Andrea Manzella, a senior constitutionalist, former Senator and MEP. Blogposts summarising some of the key contributions will be published shortly, and links to them will be made available from this page.